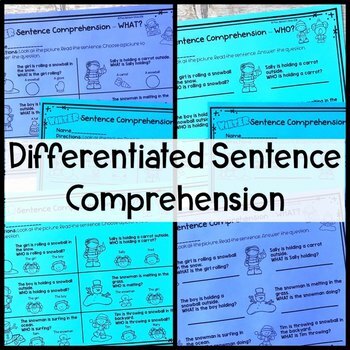 **This resource is part of my GROWING COMPREHENSION BUNDLE! Check it out before you purchase! 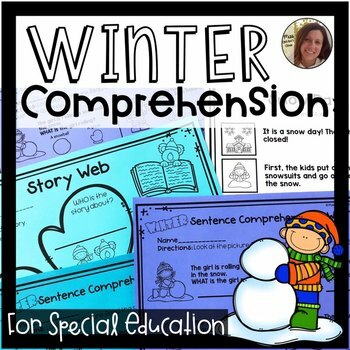 •After reading or listening to a story, the student will complete a story web (including the elements of who, what, and where) with (accuracy) in (# of trials). •Given a sentence, the student will state “WHO” the sentence is about with (accuracy) in (# of trials). •Given a sentence, the student will state “WHAT” is happening in the sentence with (accuracy) in (# of trials). •Given a sentence, the student will state “WHERE” the event of the sentence takes place with (accuracy) in (# of trials). 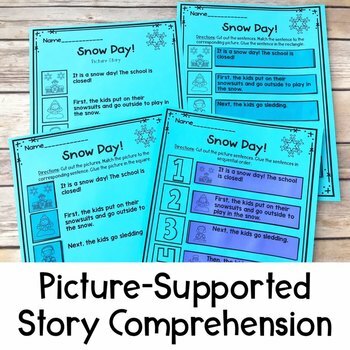 •After reading or listening to a story, the student will use picture support to retell (# of events) events in the story in sequential order in (# of trials). •After reading or listening to a story, the student will match pictures to sentences from the story with (accuracy) in (# of trials). •After reading or listening to a story, the student will match sentences from the story to the corresponding pictures with (accuracy) in (# of trials). •After reading or listening to a story, the student will sequence picture-supported sentences from the story with (accuracy) in (# of trials). January - Where is the Winter Worm? Follow my store for new resources, sales, and freebies! All new resources are 20% off the first 2 days!